The Washington Redskins have announced that Spencer Long and Shawn Lauvao have been placed on injured reserve and will both miss the remainder of the 2017 season. Long, the team’s center, has been battling knee and quad injuries over the last few weeks and requires surgery, while Lauvao, the team’s left guard, has been shut down for the season due to a neck injury. In terms of numbers, Long had actually been the team’s best performer in pass protection this year, and has allowed just five total pressures on his 223 pass-blocking snaps, for a pass-blocking efficiency of 98.2, the 10th best mark among centers. While Long will be missed, the Redskins seem to have a solid enough replacement in Chase Roullier, who has been filling in for Long since Week 7. In those five games, Roullier has allowed five pressures on his 181 pass-blocking snaps, for a pass-blocking efficiency of 97.9, 11th best among centers in that span. 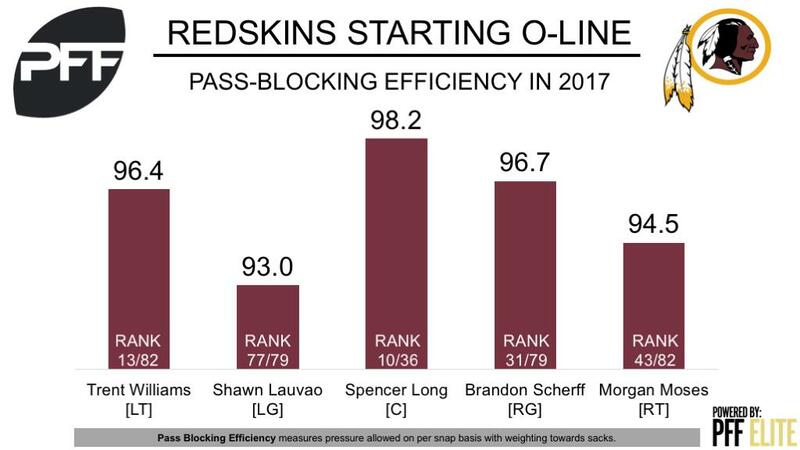 Lauvao, however, has arguably been the weak link in the Redskins’ offensive line. Through 11 weeks, his pass-blocking efficiency of 93.0 ranks 77th of 79 guards with at least 115 pass-blocking snaps, while his PFF overall grade of 38.3 ranks 71st among players at the position. Going forward, Arie Kouandijo will step in, and could very well offer an upgrade in pass protection, as Kouandijo has played 57 pass-blocking snaps this year, and is yet to allow a pressure.